By now, whether you are for it or against it, most know what the term ‘fracking’ refers to, in particular for those that are in areas fracking has impacted. But, before we get into the gut of details, we’re going to begin at a refresher starting point. High volume horizontal hydraulic fracturing or ‘hydrofracturing’ that is commonly known as ‘fracking,’ is employed by the oil and gas industry to extract methane gas trapped minutely in underground geologies that were once prohibitively too costly to produce by traditional vertical drilling means or were too difficult to gain access to. The technique involves injection of a fracking fluid consisting of millions of gallons of water laced with a cocktail of chemicals and proppant materials such as sand or ceramic beads. The injection process is conducted under high pressure (exceeding 9,000psi) down the well borehole. Pressure forces the fracking fluid into the geological formation of production interest that has been drilled into horizontally. This is achieved after the initial vertical drilling was guided to a curving bend, where the route is redirected as latitudinal by the driller. Once entering the formation forcibly, pressure from the the fracking fluid released from small holes in the piping stem, fractures the rock creating a path the trapped gas can take and collect into the borehole. The proppant material forced into the cracks, maintains stability in keeping (propping) the fracture walls from collapsing, but physically arranged as spherical, keeps the fracture zones permeable enough for gas to diffuse through. From there, natural substratum pressures force gas back up to the well head, where it can be collected. Fractures provide a conductive path connecting a larger area of the reservoir to the well, thereby increasing the area from which natural gas and liquids can be recovered from the targeted formation. Since most easy access gas reservoirs have all played out and been tapped in the last century, it’s estimated that over 60% of gas wells are now fracked. But between 2005-2009 it’s been over 90% and currently climbing. According to the gas companies, 99.5% of the material injected is water and sand leaving only 0.5% as chemicals. They claim that gas fracking will make the U.S. independent of foreign fossil-fuel energy and most importantly…create jobs during this economic downturn. The gas industry also claims methane is a cleaner fuel option to burning coal, as spent or burnt natural gas emits less carbon dioxide (CO2) fingerprints. The gas industry along with their proponents, also claim that fracking is a safe practice and measures are taken in keeping water aquifers from being contaminated. From surface to below the water table line the casings are cemented over and in some instances the borehole is double cased. They also state that all the borehole tailings and spent fracking fluid once reaching the surface, is piped to temporary lined impoundment pits or injected into deep underground drilled holes. Some well sites have above ground tanks for storing the waste. From there, whichever comes first, once it is full or operations cease, the stored waste is properly disposed of. In justifying homes where there is methane contamination in their drinking water supply near active or former fracking activity, the gas industry’s argument goes that it is simply the natural accumulation of methane seepage. The Cheney secret energy meetings with the electrical power companies and oil & gas industry in early 2001 came up with legislation that oil companies may now be immune to EPA monitoring, were exempt to the Clean Water Act regulations and did not have to divulge the chemicals being used by merely stating that they were corporate intellectual property under proprietary rulings. With these humongous advantages in place of dissolving ecological responsibilities, a disregard of environmental health issues and exemption from the Clean Water Act, gas companies commenced fracking production at an accelerated pace. With laxed regulation and without any official environmental oversight, except for the gas companies’ own internal regulatory reviews guided by making the dollar, fracking production pounced onto America’s landscape. At first it was more rural, but it accelerated its way into public lands and populated areas, even into the backyards of residential homes with children at play. Pennsylvania has more than 3,000 fracking operations alone with fracking wells within two miles of 320 day care centers, 67 schools and 9 hospitals. In countering the gas industry’s argument discussed above and with a few added extras, let’s highlight each of their defenses first and then we’ll attempt to be a bit more truthful than they are in the facts. 1. Only 0.5% of the fracking fluid is chemicals. 99.5% is merely water and sand. 2. Chemical additives are trace in amount, safe and do not pose a health risk. 3. In combusting, methane is the cleanest fuel and emits little CO2. 4. The water table is protected from any contaminant leakage with double casing and cement. 5. Fracking wells will not have a blowout as conventional wells will. 6. There are no gas leaks from underground or above surface to create blow outs simply because the gas is residual emanating far underground below the water table. 7. Fracking fluid is carefully and safely impounded then disposed of. 8. For local communities fracking activity is economically sound and creates jobs. 9. Any radiation produced is not enough to be biologically harmful. 10. Fracking will wean the U.S. from foreign fossil fuel dependency. Only 0.5% of the fracking fluid is chemicals. 99.5% is merely water and sand. 1. In 2009 there were more than 443,700 fracking wells in operation across the U.S. That figure is higher now at over half a million. Well production is expected to continue well beyond the next two decades. For 2010, the EPA estimated that up to 140 billion gallons of water was used to fracture only 35,000 wells. A single well uses anywhere, from two million to ten million gallons of water that has to be withdrawn from a source and transported. On average, a heavy water truck will take 1,000 round trips to satisfy the water requirements in drilling a fracking well. In 2008 during a Pennsylvania drought, water taken from and released back into the Monongahela River as fracking fluid waste, so overwhelmed the river, local officials strongly advised the Pittsburgh public to only drink bottled water. Of the claimed 99.5% of fracking fluid in being water and sand, that composition is further broken down as 90% water with the remaining 9.5% as sand. That amounts to a lot of sand. Fracking well usage on average uses more than 4 million pounds of sand per well. Sand mines that cater to fracturing gas are scrambling to keep up with new sand mines springing up all over from Texas to Wisconsin. These mining operations themselves have environmental impacts and health issues in scarring the land, air pollutant emissions and water consumption. Plus in being a solid, polluted sand is much harder to decontaminate, as it traps pollutant particles. This is a two-fold problem. What comes to the surface would have to be repeatedly rinsed creating much more liquid waste and what stays down in the borehole and fissures could eventually make its way into the water table, only then to release its pollutants after being filtered by the aquifer’s current. Chemical additives are trace in amount, safe and do not pose a health risk. 2. Between 2005-2009, the gas industry used at least 750 types of chemicals amounting to 750 million gallons. That half of a percent adds up in a hurry, although at times chemical additives in fracking fluids have reached upwards to 2.5%. A 4 million gallon fracking fluid gas well will typically use a minimum of 80 US tons (160,000 lbs) to a maximum of 330 US tons (660,000 lbs). Chemicals are added to adjust viscosities, develop specific rheologies, act as surface tension surfactants, to act as anti-corrosive agents, to defoam, stabilize certain minerals as clays, maintain pH levels and an array of other physical constants. “I have fracking fluid taken right out of a fracking truck. I’ve had it in my mouth. I’ve tasted it. And I’m just fine,” so confessed Kathy Hall, a former Colorado Oil and Gas Association lobbyist. Ms. Hall stated in the Denver dispatch newspaper, “There’s nothing more dangerous in that fluid than what’s in your make-up, honey, or your toothpaste, or what you use to clean your hot tub.” So she claims…but why are the gas companies so insistent in keeping their chemical additives from government officials and the public? If it is so safe that you may put it into your mouth and swallow without ill-effect, then why are they fighting hard tooth and nail to not divulge the chemicals used? Why…because a lot of them are harmful. I would hope that most proponents would not go this far in defending hydraulic fracturing practices, for point blank, these kind of statements can only have slobber value…it’s idiotically nonsensical nonsense. But reasons the industry won’t really divulge their fracking chemical components is simply due to the fact that they are harmful to health and environment. Due to sampling and analysis of spills, a congressional hearing and a handful of gas companies revealing their chemicals under public pressures, it’s becoming clear what certain chemicals the gas companies are putting into fracking fluids or ‘slick water’ as the roughnecks call it. They range from salts, acids, alcohols, glycols and biocides to polycyclic aromatic hydrocarbons. Some of the chemicals extensively used are known carcinogens, air and water pollutants, volatile organic compounds (VOCs), neuropathic and nephropathic agents and material that exceeds the Clean Air Act & Safe Drinking Water Acts (SDWA) exposure limits or threshold limit values (TLV) and OSHAs permissible exposure limits (PEL). Currently, twenty-nine toxic chemicals are combined or blended together to make 652 toxic products used in fracking. 1. Butyl Cellosolve, (2-butoxy ethanol/ethylene glycol mono butyl ether ) ~ also known as EB is carcinogenic, detrimentally affects central nervous system, especially in children, HAP, SDWA. 2. BTEX ~ is a cocktail of an organic solvent blend consisting of: Benzene, Toluene, Ethylbenzene and pXylene; all are VOC, HAP & SDWA; benzene is carcinogenic. 4. Diesel ~ carcinogen, HAP, SDWA. 6. Sulfuric Acid ~ carcinogen. 8. Formaldehyde ~ carcinogen, HAP. From 2005 to 2009 Texas led the states in the amount of butyl cellosolve used at 12,031,734 volume fluid gallons. Oklahoma placed second at 2,186,613 gallons, while in Pennsylvania 747,416 gallons were used. A chemical not in the above list that is toxic and HAPs listed is methanol. This alcohol appears in 342 fracking products. Ethylene glycol is used in 142 products. In combusting, methane is the cleanest fuel and emits little CO2. 3. Combusted methane does release CO2, but yes, it is much less than combusting coal and doesn’t emit all the other sulfate pollutants found in coal combustion. What the gas industry doesn’t add into the equation though is gas leaks. Methane released into the air is a far more efficient heat trapping absorbent than carbon dioxide. Methane’s current GWP rating over a 100 year horizon is 21-25 times that of carbon dioxide. The GWP or ‘global warming potential’ for methane is ~23.5, where carbon dioxide is 1. From the well itself via transport to facilities, gas leaks indeed occur. A fracking site near public water, Pa. The water table is protected from any contaminant leakage with double casing and cement. 4. Extra effort from the platform down past the freshwater table is put into place to seal the borehole, but accidents, wear and corrosion do occur. Leaks in a piping stem that is thousands of feet long are a constant ordeal during production. Below 1,000 feet, if there is any water it is normally saltwater. Being in close conjunction to the freshwater table, brine contamination has its pathway opportunities to infiltrate freshwater aquifers once drilling commences and ceases. No one can dictate how underground formations will shift or fault over time. Piping, in particular piping exposed to fracking fluid acids, hydrogen fluoride and bromine will corrode. These chemicals actually accelerate metal fatigue and corrosion. Anyone who has walked a cement sidewalk, knows that it cracks from the ravages of weathering and earth shifts. The cement poured to reinforce the borehole’s casing is subjected to the same forces and will over time, crack. There does not have to be an immediate contamination threat to a water table used for drinking to be considered as still dangerous. 55-90% of the millions of gallons of toxic fracking fluid does not resurface, is not recovered and remains in the hole. Over time, with Earth's slight shifting and substrata movement, a contaminant opportunity could arise at any time. No gas company in their right minds will guarantee the life of the fracked well as free from contaminating subterranean drinking water sources. Fracking wells will not have a blowout as conventional wells will. 5. It is true that a traditional blowout will not occur with a resultant major fire in fracking wells as witnessed in the BP Gulf Coast incident, but accidents do occur. Accident reports are currently generated by the gas companies, not regulators or environmental officials; that’s just the way the system has been designed. Even when accidents are reported to the proper authorities, these officials are hesitant to levy fines or harsh judgments onto the gas company out of fear they will quit reporting accidents altogether. Of course, there have been some accidents that gained everyone’s attention without a report due to its magnitude. There have been over 1,000 accidents at fracking well sites that have posed serious environmental and health risks. They may not create the fireworks of a traditional blowout, but just the same they are dangerous and prove that the chemicals used, even diluted by the water they’re in, will still immolate just like a mini blowout. Just this past September in Frio County, Texas, seven Mission Well Services LLC hydraulic fracturing trucks filled with fluid waiting in line to feed the piping into the borehole caught fire and burned to the ground. Mission Well Services officials still haven’t revealed to the public exactly what happened, stating the investigation has been taking months to conclude, but apparently, methane was escaping from the piping and flashed catching the nearby truck on fire that quickly engulfed the other six in line loaded with flammable fracking fluid cargo. There are no gas leaks from underground or above surface to create blow outs simply because the gas is residual emanating far underground below the water table. 6. True, there will be no roaring traditional out of control blowout fires, but nonetheless, hydrocarbon gases such as methane, butane and propane are being collected and accumulated in the borehole; that’s the whole idea behind fracking operations. As accumulation progresses, gas volume increases in a confined and pressurized containment, to the point it can support an explosion and fire. That is apparently what happened at the Husky fracking site in Alberta. While extracting gas (in this case propane) from the well, it flash exploded, then caught fire injuring thirteen from singed hair to first degree burns and fractures. A major fire that originally had nothing to do with gas or oil, but strictly the fracking fluid occurred west of Walton City, North Dakota this past March. The fracking line located on the surface caught fire that quickly spread to oil stored onsite. The raging burn lasted nearly a week before it was contained and oil and gas had to be burned off to keep the fossil fuels from feeding the fire. Also, an oil truck was still onsite that if caught fire, a potential explosion could have occurred. The well was managed by SM Energy. Fracking also will cause gas to migrate in all directions once the formation it was sealed in is fractured. This multidirectional migration includes going into the upper formations that may already be faulted up to the water table and surface. The fracturing process is not solely limited to the target formation. It can create seems in upper layers, where the gas may travel forced upwards by strata depth, heat and pressure. Finally for the first time this past spring, a scientific study was concluded and published by the Proceedings of the National Academy of Sciences that emphatically linked hydraulic fracturing to methane drinking water contamination. The study found that the type of gas found at high levels in the water table and in people’s home water lines were the same types of gases the gas companies were extracting thousands of feet below the surface. This heavily implies that indeed gas is seeping upwards from manmade or naturally induced faults created by the fracturing process, or even from faults in the well structure itself. The points of study were conducted from 68 well sites in the Marcellus and Utica shale formations. Fracking fluid is carefully and safely impounded then disposed of. 7. Fracking fluid waste is not stored nor treated properly. From 10 to 45% of the fracking fluid is forced back up the borehole by static pressure known as ‘flowback.’ In addition to the chemicals in the fracking fluid, naturally occurring underground materials such as salts, arsenic, hydrogen sulfide and radium radiation are now included to contend with. 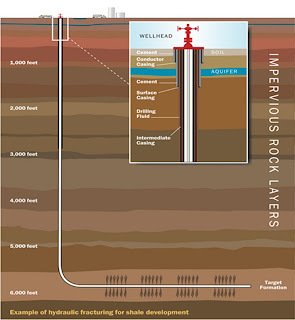 Most shale layer formations deep underground are ‘hot’ or radioactive. This material has to be stored and stashed somewhere. 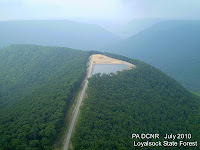 In Pennsylvania, the underground geology is not suited for deep well injection period, much less for underground storage, so containment pits are used. Marcellus shale is very fissile and brittle, prone to crumbling and leaching. Also, where actual well fracking is not regulated, well storages are, so gas companies try to avoid deep well storage sites. The onsite containment pits’ linings have been observed to tear and rip on many occasions, releasing the fracking fluid. Containment pits of course, are temporary storage sites, so the contents have to be later dealt with. Usually it is pumped out and sent to other regions where deep well storage is permissible or sent to water treatment plants to contend with. This past April, in Leroy Township, Pa. at Chesapeake Energy’s Atgas 2H well, there was a mechanical failure right in the middle of frack drilling that created a leak just underneath the blowout preventer (BOP). The fracking fluid leak could not be immediately turned off allowing tens of thousands of gallons of fracking fluid to be released contaminating Towanda Creek, a popular trout fishing stream. Onsite containment pits were used but failed. Due to consistent rains, the pits at this site quickly filled from the discharge and overflowed releasing the fluid into the local environment and into the creek. Dairy farmers were told not to allow their livestock to drink from the contaminated creek waters, but how hard is it to keep free ranging cattle from going to their local watering hole? The sole culprit to this disaster was that a steel coupling located just beneath the BOP failed allowing the fracking fluid to spew out leaving no way to immediately shut it off. Unfortunately, there was no accountability in foresight that weather can affect fracking operations. By the way…Chesapeake Energy, the owner of the well, is one-third owned by the Chinese state-owned energy company. Any methane coming from this site, I wonder…what market is it ultimately bound for? For local communities fracking activity is economically sound and creates jobs. 8. Well, if you think that temporary fixes are great, perhaps fracking sites are an economic boost to local communities, but even then, not so much. For every fossil fuel boom, ultimately there is a bust to follow. Seventy percent on average of all fracking rig workers are from out of town. The right-of-way leases granted are a pittance and the landowner must have a lot of acreage to make any monthly worthwhile income. The heavy trucking is true wear and tear on local roadways and bridging and then they’re gone leaving behind rutted rural roads and potholed paved streets. In Dimock, Pa, they received a boost in the local economy of around $240,000 due to a Cabot Oil & Gas Corporation frack gas well. But because of three fracking fluid spills totaling 8,420 gallons contaminating the local water supply, it’s costing the town more than $10 million to transport safe water to the affected homeowners. In Wise County, Texas landowners with fracking gas wells have lost 75% of their property value. There are many other examples too numerous here to comment on, where costs exceed the returns for local economies. Any radiation produced is not enough to be biologically harmful. 9. It’s true, if you are strictly speaking of external exposure. Radium radiation up to a certain concentrated level is easily shielded by thin structures such as skin. Radium is an alkaline earth metal found in shale formations as radium bromide, radium chloride and the water soluble radium hydroxide and radium nitrate. With four naturally occurring isotopes, all of which decay into radon that’s a radioactive gas we are constantly exposed to naturally when we enter the basement or cellar. Unless your basement is tightly sealed to trap and accumulate concentration, not to worry, your skin is your defense in shielding you from the radioactive effects. But the problem with fracking is not in the radiation coming to the surface for direct external exposure, it is what is contained in the fluid flowback that will be sent to sewage plants for treatment or what radiated fracking fluid remains in the borehole or still in situ in the shale formation to later contaminate the water table. If radium radiation or radon diffused gas is ingested through drinking water, a variety of biological defects will occur. Radium is chemically similar to calcium and if it enters the body through ingestion, it will replace calcium in bones creating degradation of the marrow and mutation of the bone cells and will cause cancer throughout the body. We only have the studies for there are no determined methods in place yet to monitor and analyze radioactive fracking fluid waste. Along with the accompanied brine compounds, heavy metals and solvated hydrocarbons wastewater facilities are not equipped to analyze, manage and treat fracking fluid with radioactive material. A recent study, in analyzing flowback waste accepted at wastewater treatment plants, radiation levels in some instances,15 in fact, were 1,000 times higher than the threshold limit standard set up by the EPA. 116 fracking wells out of 179 checked had radiation levels one hundred times higher set by federal drinking water standards. In Pennsylvania, total dissolved solids (TDS) in wastewater plants that accepted flowback waste was more than double the accepted high end range of 500mg/l (milligrams per liter). In the past three years, more than 1.4 billion gallons of flowback waste was generated and sent to Pa. wastewater treatment plants that could not adequately treat the waste and simply discharged it into the waterways after normal sewage treatment. For 2010, Pennsylvania water treatment could not account for the disposal method of 1.28 million 42-gallon barrels of flowback waste that was eventually dumped into the waterways. The Niagara Water Falls Treatment Plant is in one of the hardest hit areas of the recession. Left operating far below capacity and loss of revenue coerced the town of Niagara Falls to be one of the first to accept flowback waste, but they are not equipped to handle this waste and guess where the plant’s final effluent is going into. That’s right, right into the Niagara River and down the falls. Thankfully, public outcry has stalled the proceeding due to public protests and hearings, but in still being permitted by the state to do so, it could happen. Meanwhile, tests conducted on rural shallow water wells near active or completed fracking wells have verified elevated health risk levels of benzene, methanol, ethane and methane to the point, occupants had to be evacuated from their homes. So, the gas companies go with semantics in stating that it is the natural seepage of methane contaminating the water wells. Still doesn’t explain away where the benzene and methanol came from and that the housing tap water couldn’t be ignited prior to fracking activity. I would like to see them with a straight face and eye-to-eye tell the affected people driven from their homes this. Fracking will wean the U.S. from foreign fossil fuel dependency. 10. Perhaps so, but assuredly not. Gas is one part of the fossil fuel equation America is addicted to, but oil is the greater half of the equation. As long as we are the top-end of the world’s consumers of oil, we’ll never be independent. I’ve stated it many times before, how long are we going to pursue non-renewable fossil fuels when reserves are quickly dwindling at the same time the whole world is gaining a larger appetite for it as well? Fossil fuels are an expediting dying dinosaur and are about to become extinct. No more of the stuff is being made. Are our politicians going to allow us to go to war for that last drop of oil or cubic foot of natural gas? We urgently need to bite the bullet on this one. We have the technology and expertise to truly pursue alternative energy sources, but don’t want to put the time and expense into it. It’s downright shameful. Green energies first thought of, designed and developed right here in the good ol’ USA died on the vine due to lack of interest, but was picked up by other countries and have succeeded. SamsØ Island off the coast of Denmark is totally carbon neutral in its energy usage, using technologies that were first developed right here in the states. They don’t fret much about the price of oil. In fact it doesn’t affect them at all. “I’m not an activist, an alarmist, a Democrat, environmentalist or anything like that. I’m just a person who isn’t able to manage the health of my family because of all this drilling,” notes Mrs. Kelly Gant of Bartonville, Texas. She ends with, “It’s ruining us.” Mrs. Gant is referring to the severe asthma attacks her fourteen year old daughter and eleven year old son developed ever since fracking started up near her home two years ago with a well and compressor station. Never before the drilling activity had the children complained of difficulties in breathing, much less asthma attacks; only after activity started. There has been only one extensive EPA study of fracking activities and that was in 2004 under strict orders by the Bush administration, in particular Cheney to make the final report industry friendly. Cheney even had business professionals, not scientists in the Bureau of Land and Mines edit the report. Naturally, the final report came out stating that hydraulic fracturing poses little or no threat to drinking water and that no further study was necessary. In Pennsylvania, hydraulic fracturing is at ground zero for the Marcellus shale play. The Marcellus shale formation stretching from West Virginia, eastern Ohio, to central New York, runs all the way through Pennsylvania. It is considered by some, 'as is oil to Saudia Arabia, so is gas to Pennsylvania.' For the keystone state public, it doesn’t look too healthy for the moment. Republican governor Tommy Corbett, who took more than double the campaign contributions from the oil & gas industry than all his opponents combined, has stated the industry is overly regulated and is refusing a proposal to levy a gas extraction tax on the industry. This amounts to a pittance for the industry in totaling $2 million a year that is intended to help offset the cost for the state in the treatment of flowback waste. Corbett has also cleared the way for gas companies to drill as many as 10,000 fracking gas wells on public lands. Most Republican politicians are doing their best to keep any regulations from monitoring fracking, but one that stands out is Republican Congressman of Ohio, Bobby Gibbs. He rants constantly about too many regulations are already in place and constantly raves about the so-called positive economic impacts from expanded fracking operations. If the gas industry ever needed a poster child, Gibbs has got dibbs. Too much regulation they whine, well as it stands now, if they want to drill in your backyard, you may not have any say in hindering their efforts. This happened numerous times in the Barnet shale play around the Greater Forth Worth area in Texas; even in front yards for that matter. In trying to change this arrangement by allowing citizens to have more say in their environment, health, safety and ownership, more progressive legislation came up in the Fracturing Responsibility and Awareness of Chemicals Act, or for euphony, the FRAC Act. The bill has two purposes. One is to require gas companies to disclose the chemicals injected underground and two, to eliminate the exemption gas companies engaging in fracking currently enjoy from regulations carried under the Safe Drinking Water Act (SDWA). That’s all, there is no red tape binding this piece of legislation and it gives the latitude to states to administer the provisions of the bill. Also, states can tailor their own legislation to fit the bill. Most Republicans and the gas industry are fighting this act to the nub under the guise it will hurt job creation. Nonsense, it’ll only hurt the egos of those wanting to make profits off the backs of the environment and the public’s health. It is difficult to imagine the authority these gas companies have in basically regulating themselves while mismanaging the public at the same time. If yore gonna drill in my backyard, ya had dad-burned better tell me what yore drilling with. The thing is here, is that frack drilling as it currently stands is a dangerous method in extracting minute forms of gas from a very brittle substrate and is very shortsighted greed on the gas companies part along with the politicians who blindly support them. 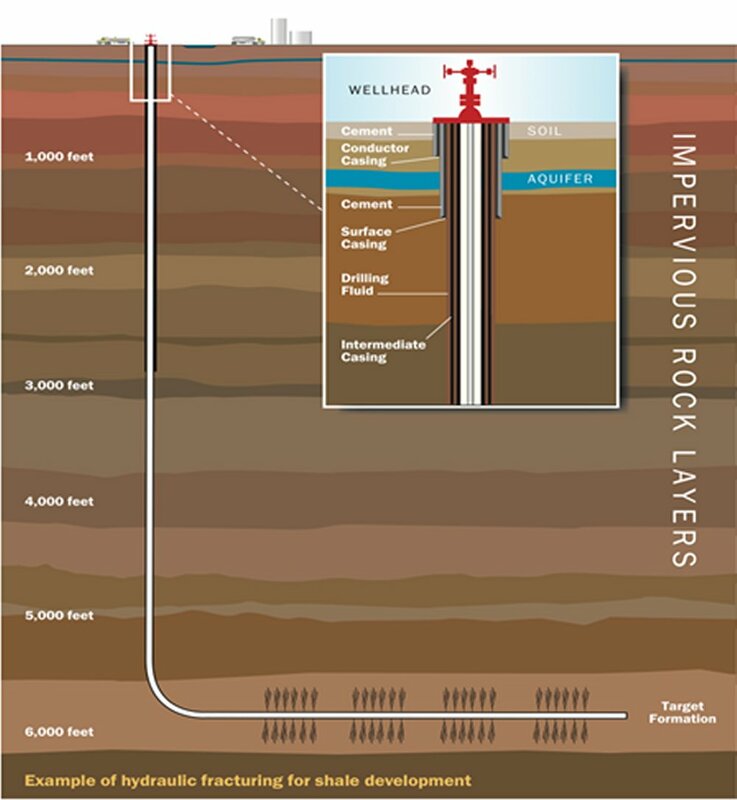 Fracking was originally developed to drill vertically in stable sandstones. As it stands now, hazards associated with horizontal drilling in shales are far less understood and regulations and regulatory staff have not kept pace with the rapidly expanding fracking industry. Gas companies are learning as they go at the expense of the general public. Air borne contaminants are a big negative result as well from fracking. The state of Wyoming in 2009 for the first time in its history failed to meet federal air standards since 27,000 fracking wells started up five years ago. When we think of Wyoming we envision pristine mountain air far from polluted urban industries. Sublette, a rural Wyoming county with a high concentration of fracking VOC emissions registered a higher concentration of smog or ozone layer than Los Angeles or Houston did with all their gas guzzling vehicles. Earthquakes have come into the fold too. Arkansas, even in northwest England where seismic activity has never been recorded experienced numerous small earthquakes just after fracking activity. Recently in Oklahoma, the first part of this November, a 5.6 magnitude temblor occurred 45 miles east of Oklahoma City. This was in conjunction with fifty minor quakes of 1.0-2.8 magnitudes. In 2009, Oklahoma registered 1,047 tremors. All of this trembling preceded the fracking activity that commenced heavily in Oklahoma in 2008. Gas companies with no hesitation deny any connection, but they do know fracking originally was used a lot in water drilling and in water tables in coal beds. 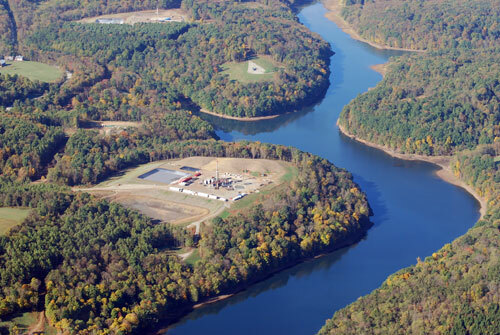 The fracking actually was incorporated to create minor tremors and disperse the water. Fracking essentially is a massive pipe bomb that not only creates fissures, but pulverizes and crushes shale. We need to lay back a bit and do some serious reevaluation. The problem with fracking is that it knows no borders. If a neighbor next to you gleefully signs a lease…contaminated subterranean waters, formations and air don’t stay within the borders of his land, they reach out to yours as well. If we feel the need is so urgent to pursue natural gas, fine. But let’s develop a more efficient way in how to get at it and leave as small a fingerprint as we can on the environment and the health of the public’s good. I leave you with an Earthjustice video for your viewing enjoyment.